Craft Cardboard Body: Collect toilet paper tubes, construction paper, glue sticks, and kids' scissors, and arrange them on one end of the table. Invite your kids to make the bodies. First, help them cut the tubes to a desired height, then wrap a construction paper rectangle around the tube and glue it in place. Next, cut and glue on paper arms, ears, and accessories. Glue on Face: Have kids pick and choose facial features from various craft supplies, such as colored paper cutouts, cotton balls, yarn, ribbon, pom-poms, googly eyes, and stickers (for easy access and simple sorting, we packed all the supplies in a large muffin tin). They can then use glue or double-sided tape to attach the features to the eggs. 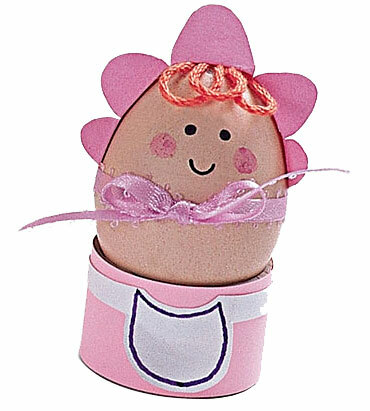 To make an egg-spressive baby, add a paper bib to her pink outfit and glue a paper bonnet and a few strands or tufts of yarn hair to her head. Finishing Touches: To complete the egghead, place the egg on top of the tube body. Add any finishing touches with permanent marker, such as eyes, noses, rosy cheeks, and freckles.